Rylands offers extensive relocation services to all office-based and retail businesses. Although a Manchester-based removals company, Rylands provides its reliable and efficient services to businesses in the whole of the North West and throughout the UK. Whether you’re looking to relocate, or simply clear the property in preparation for a refurbishment, our commercial and office removals services can provide for your needs. With total flexibility, including evening and weekend moves, we are able to work your office or retail move around your hours of business, offering you maximum convenience with minimal disruption to your operations. Our skilled and friendly team will dismantle and carefully pack all delicate equipment/products, including desks, computers and electronic equipment, before safely transporting them to either the new location or into storage. With free goods-in-transit and public liability insurance on every move, you can be sure that everything is completely protected. Should you require, our comprehensive storage facilities in Manchester offer both short and long-term options. 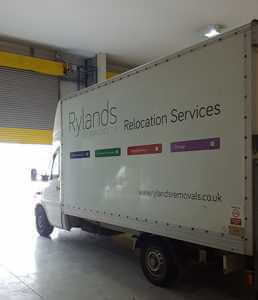 Get in touch with Rylands today for more information on all our commercial and office removals services or for a free, no obligation quote.